Time to go old school and visit the arcade with Funko Retro Video Games Mystery Minis. The set features several fan-favorite characters from popular 1980s arcade games. The blind-box release keeps the element of surprise, which might make it slightly challenging to collect your favorite figure unless, of course, you love them all! 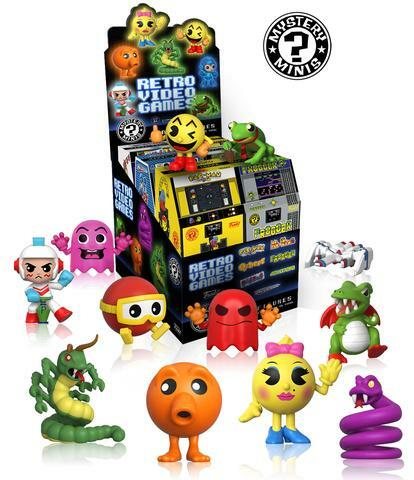 The Funko Retro Video Games Mystery Minis set covers renowned game lines including Centipede, Dig Dug, Frogger, Mega Man, Pac-Man, Ms. Pac-Man and the timeless Q*bert. Adding greater depth, some of the franchises are represented by several options such as Fygar (dragon) and Pookah (cute red dot with goggles) for Dig Dug, and Coily along with the title character for Q*bert. Not surprising, Pac-Man gets the most company with the infamous ghosts "Pinky" and "Blinky" as well as Ms. Pac-Man by his side. Check out some classic video game options on Amazon. Although each miniature box is packaged the same, collectors have a greater chance of completing the full set given there are 12 boxes per case and only 12 known figures. However, since the specific odds are not available, nostalgia fans should keep in mind that some subjects may carry a higher rarity ratio than others. And, of course, there is always a chance for exclusives to be added, although no announcement has been confirmed at this time. Each Funko Retro Video Games Mystery Minis figure stands approximately 2 1/2" tall.